Keep Florence Beautiful believes in engaging our community and in doing so we find our latest recycling initiative to be a very exciting and diverse plan. Saturday, 6/27 from 11am to 3pm, the Florence community will gather for a city wide recycling cleanup; starting point is Timrod Park. The cleanup will consist of a “hunt” for materials/recyclables that can be used to create a piece of art. Participants will remain off of the right of ways and will not enter on to private property to look for supplies. 8/7/2015 art is due to Timrod Park, KFB Building between 4-6pm. $5 donation to view and vote on art pieces. Recycling educational games for adults and children and other activities. 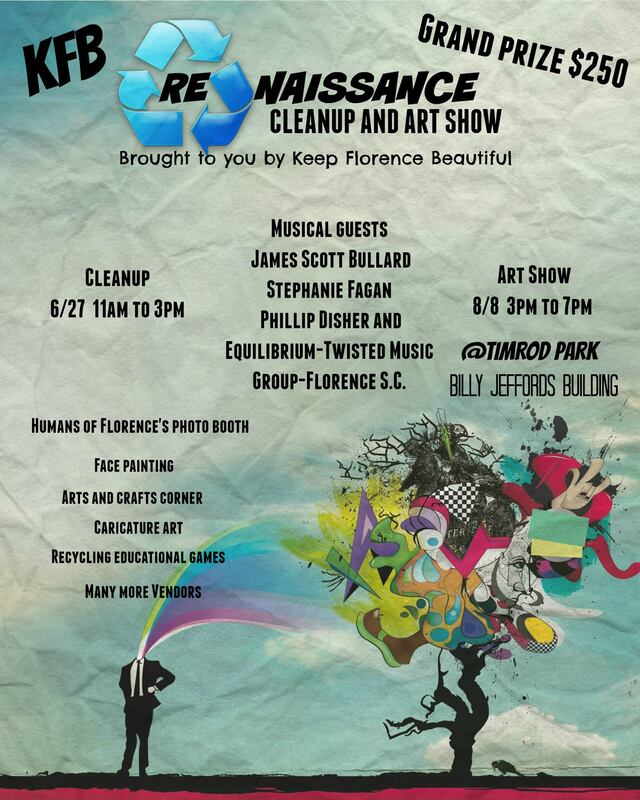 Musical artists to include James Scott Bullard, Stephanie Fagan, Phillip Disher and Equilibrium-Twisted Music Group-Florence S.C.
Local artist will be on hand to draw portraits in minutes, face painting for young and old. Arts and crafts corner usable material supplied.